To say I am not a morning person is a severe understatement, so I was a little grumpy when Daz dragged me from our warm tent at 7am. He was right though; the view was worth it. “You need to come and see this,” Daz said to me, trying to coax me out of the tent. 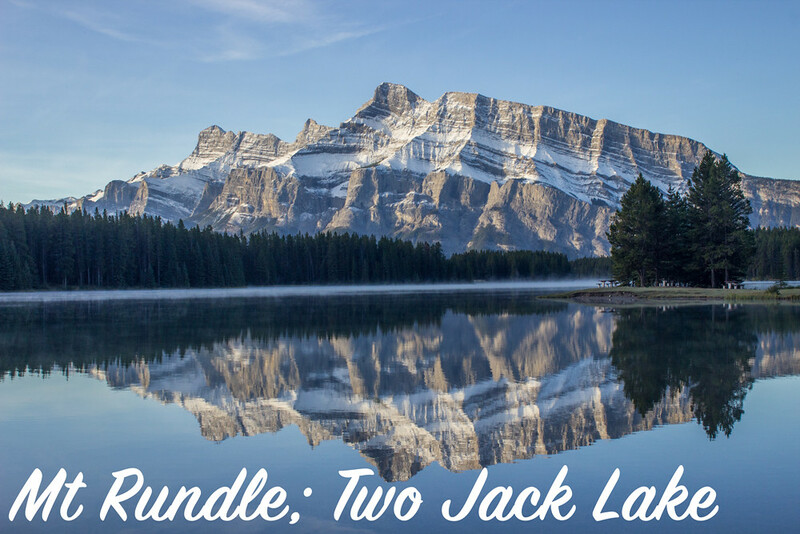 We spend the last couple of nights in Banff camping at Two Jack Lakeside Camground, which I definitely recommend because it’s a beautiful little spot that is just a short drive from Banff. 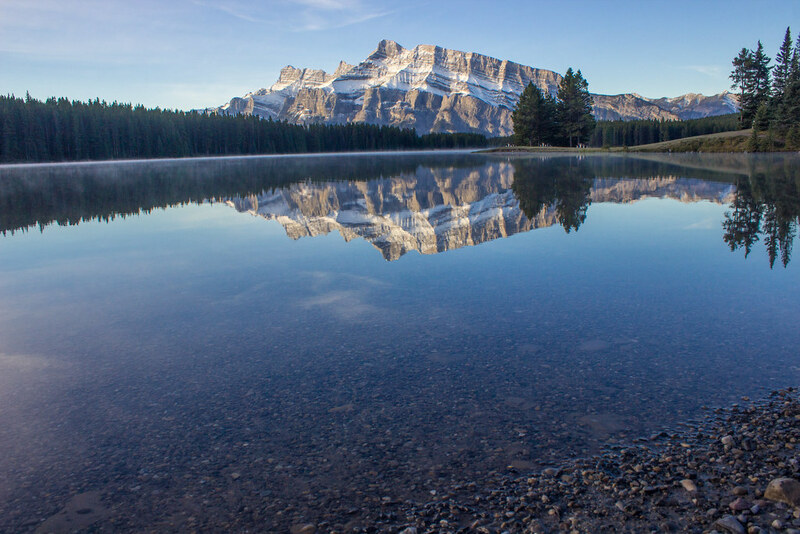 It was cloudy most of the time while we were in Canada and I was a little annoyed at not having seen a good sunrise or sunset, but this view of Mount Rundle’s perfect early morning reflection in Two Jack Lake more than made up for it. I’m so glad Daz was up early to spot this because it was one of the highlights of the trip for me. I feel like I say that on every post about Canada, but seeing this on our last morning and visiting Moraine Lake were the two high-highlights for me. These are my camping “pyjamas”. 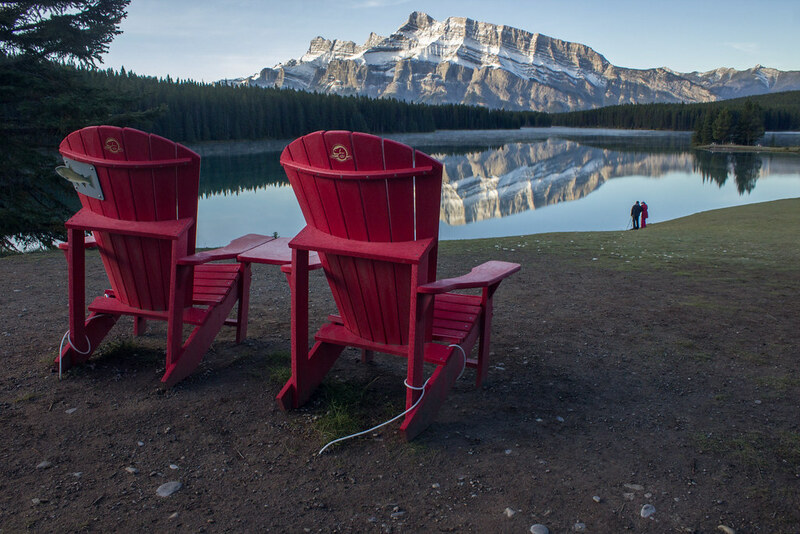 Atop a little hill overlooking Two Jack Lake is two of Canada’s famous red chairs, so if you’re on a mission to sit in all the red chairs, you cannot miss this. 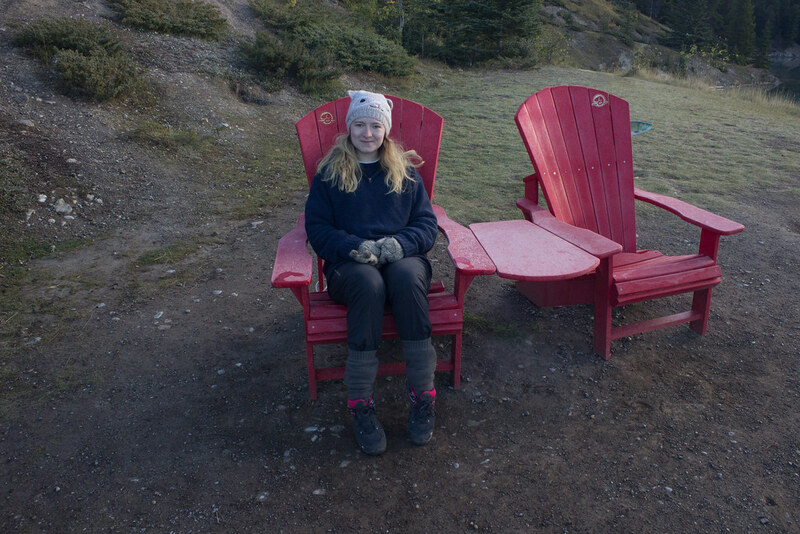 Parks Canada has a full list of the red chair locations here. If you’re stopping in, or visiting Banff, it’s worth visiting Lake Minnewanka and Two Jack Lake. 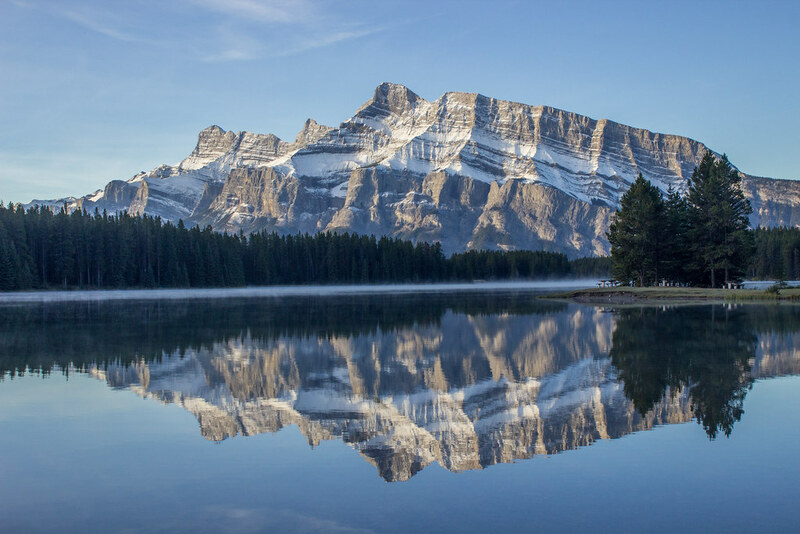 There’s a scenic loop road called “Lake Minnewanka Scene Drive” just off Highway 1, which is probably a good 15 – 20 minute drive through some stunning scenery. Take note that part of the loop is closed between November – April for conservation reasons; but you’re sure to enjoy the part of the road you can get on. We loved camping at Two Jack Lake so much that we’re spending a few more nights here while we explore Banff and Canmore some more this summer. Hopefully it will be less cloudy and we’ll be able to see a beautiful pink-orange sunrise or sunset at this spot as well.